Speaking of Christmas presents Mr. Moore, the head of the Cinema department gave me a Christmas present the last day of school. The best book published about cinema is now out of print (collectors item and that) well, I’ve been a tryin’ to find one in a used book-store…but Moore had already bought up every copy on the West Coast…so I couldn’t find any. Well, anyhoo…he gave me one of his copies for Christmas! Surprised me…don’t know yet whether I thanked him or not or just looked stupid (O.K. Louis, “as usual”) ‘Twas nice of him, anyhow…especially with folks all trying’ to buy the few copies he has left after stocking up the Library. Before I was interrupted I was telling about the Grahams present…Doris got some slips or something like that etc. etc….and we both got a large box of cup-cakes we are in the process of devouring with the Cherry Jam Mrs. Graham sent us a bit earlier. Speaking of food…Did you-all can any chicken this year…WELL!!! (Can’t you take a hint!) (‘Splain it to ‘em Pee-Wee. Pee-Wee ain’t home, she’s out amongst em’…well, you ‘splain it Gladys…She ain’t home either…O.K.) Find attached sugar stamp which we let the OPA slip by us… Thought maybe you-all could still find some use for it… (Know what I mean.) Mrs. Graham’s got (or had) 5 pounds for you-all. Really ain’t no need for no nother sheet of this! 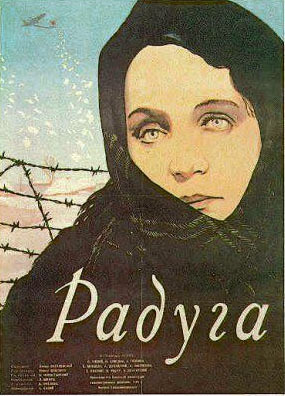 You can read a review of the movie Raduga/The Rainbow from the October 1944 New York Times by clicking HERE. You do have the wealth of info on your family. And the way you present! Your Father was quite the Guy back in the day, as in my time, too. the book, if you don’t do it; who will?! Oh, I’m old enough to remember the ration stamps. Fun to read the humor in the writing too. another great post! i love the comments about his “little wife” and the flavor of their lives before their daughters arrived! oh my, i love your new look and your new neighborhood. i’m thinking of moving my blog, too, and was wondering if you could give me some pointers on how to do it so seamlessly as you have!